Claire Moore is a former schoolteacher and civil servant who moved from the classroom to the gym. Her business, Believe and Achieve, was named Best Ladies Gym in the UK at the recent National Fitness Awards. In this latest episode of my Business Live radio show, available as a podcast below, Claire describes her journey to fitness, how that led to a part time career in the industry then making the leap to running her thriving business. Claire also has some brilliant and realistic advice for business leaders who want to look after their health but can’t find the time to do so. 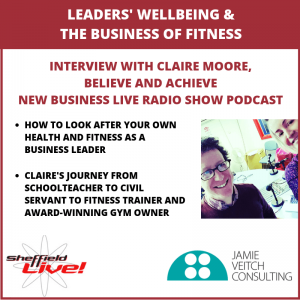 If your wellbeing or fitness gets pushed down your priority list because of the demands of your business, you must listen to this – you will be able to implement Claire’s tips. How Claire ensured her clients valued her expertise, paid her, and avoided awkward “can you also just…” conversations. The education, confidence and mindset work that Believe and Achieve offers were particular factors which impressed the judges of the National Fitness Awards. What’s next for Believe and Achieve? Believe and Achieve’s Facebook page is here and website is here.